2012 was a banner year for the NBA. After the tumultuous and lockout-impaired year of 2011, 2012 was a breath of fresh air. More than that, actually – 2012 was a venerable shot of adrenaline. It pumped up fans all over the world after the grave uncertainties in the second half of 2011. And although the consensus most-hated team of all time won the title (see below), the truncated, 66-game, 2011-2012 season still went down as one of the most electrifying. There are other news pieces, however, that are also worth a second look, which is exactly what we’ll do right now. And that statement sums up the craze that overwhelmed pretty much the whole basketballworld when Jeremy Lin, out of nowhere (literally and figuratively), just dropped a bomb and shocked everyone with his strong play. Because Lin represented the myriad of Cinderella hopefuls in the sporting world, because he was from Harvard, because he was of Asian decent, because he hit a game-winner against Toronto, because he unloaded a ton of points on the Lakers, and because of a plethora of other unexpected things, he became a phenomenon. Not just in sports, mind you. One doesn’t go on the cover of Time magazine by being just a good sports story after all. 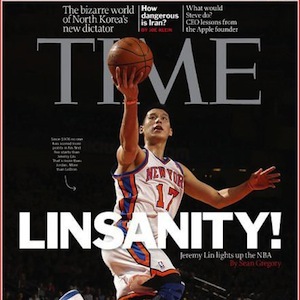 He eventually got a heckuva contract from the Rockets, and now he has taken the Linsanity to the very heart of Texas. one of the top stories of 2012. Derrick Rose tears his ACL: Derrick Rose was supposed to follow-up his MVP season (2010-2011) with another season to remember. He was supposed to lord it over the league and lead the resurgent Bulls to a plateau they haven’t reached since the Jordan years. Instead, Rose slogged through the 2011-2012 season with injury after injury, all culminating in that unfortunate moment in Game 1 of the Playoffs against the eighth-seeded Sixers. Rose jumped, passed the ball to Carlos Boozer on the wing, fell awkwardly, and never returned. He tore his ACL. The MVP was down for the count. One of his Sixer foes, Evan Turner, had these kind words to say, "I definitely hope he keeps his spirits up. You never want to see that happen, especially to someone who represents the league so well." More than the fact that a superstar tore his ACL, this was deeply grave because of the fact it was Rose. 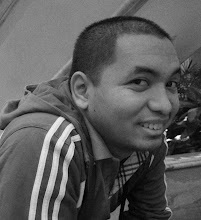 He was the purported antithesis to the mercenary-like player movements of 2010 and 2011. He represented the homegrown hero who just might rise to the very top and take his entire hometown with him. The big thought bubble now, of course, is how well he can recover from such a debilitating injury, if at all. LBJ gets his ring: Finally. After what seemed like an eternity. After all the catcalls about him not being “clutch enough.” After all the wining, all the broken promises, all the petulant premature celebrating, LeBron James got his. His ring. So did Chris Bosh. So did Mike Miller. So did Shane Battier. So did a host of others. But this was all about James anyway. It always is. And always will be. That’s not to say that Miami’s journey wasn’t worthy of applause. On the contrary, looking at it from another angle reveals a team that had to go through a lot of adversity to rise and become champs. For Miami die-hards and LBJ fanboys, this was a validation of the choices the team and its players made as far back as 2010. Their perceived sacrifices finally bore fruit. Congratulations to them, especially to Fil-American head coach Erik Spoelstra, who brought the Larry O’Brien trophy to Manila for, at least as far as I know, the first time ever. The Nets move to Brooklyn: Rap superstar and Brooklyn native Jay-Z made it official – the NBA’s newest old team would be called the Brooklyn Nets. Their colors would be basic in the most basic way – black and white. Their stadium, the Barclays Center, with its rustic (or rusty?) exterior, but divine interior, would be an homage to, a symbol for, the very heart and soul of Brooklyn. New York had two NBA teams now, and the Nets, armed with the star power of Deron Williams and Joe Johnson, were not to be swept under the rug. They were no longer the “other” team. They were gunning to be THE team from the Big Apple. Nash and Howard join the Lakers: That Steve Nash, the two-time MVP, the guy who once played behind Jason Kidd in Phoenix only to become, arguably, even better than Kidd (till Kidd got his title), the proverbial “good guy,” would go to Los Angeles in a bid to chase a championship was still barely forgivable. He’s Steve Nash. He’s just too nice. And he’s friggin’ thirty eight years old. Dwight Howard, however, was a completely different story. Here’s a guy who didn’t want to do a LeBron. Here’s a guy who trumpeted to the high heavens about loyalty. Here’s a guy who, let’s admit it people, had a hand in Stan Van Gundy leaving Orlando and still had the gall to wrap his big arms around SVG’s shoulder during a presscon. Here’s a guy who made known how, in the event he would indeed be traded, he wanted to play only for Brooklyn and with Deron Williams. Here’s a guy who took us all for a ride worthy of Magic Mountain only for him to end up in purple and gold. So, apparently, he DID want to do a LeBron, only he didn’t want to be hated as much as LBJ was. Well, here's some news for you Dwight – you are hated. Some corners of Florida hate you more deeply than the degree with which some people in Ohio (okay, everyone in Ohio) still hate LeBron. And you’re, what, all of 27? once we take out Metta World Peace of course. What is with these kids today? They know they can’t win “on their own,” so they join up with other kids to form super teams. When Barkley joined Drexler and Hakeem in Houston, their mean age was about 33. When KG and Allen joined Pierce in 2007, their mean age was about 31. When LeBron and Bosh joined Wade in 2010, their mean age was about 27. Now we have Melo and Amar’e in NYC. We have Dwight with Nash, Gasol, and Kobe (okay all three of them aren’t exactly spring chickens anymore). We could’ve had CP3 as a Laker, too, if not for David Stern’s intervention. Welcome to the era where glossy victory trumps heroic pride. This is why Jordan will always be the best, at least for me. He didn’t join up with superstars. He made the guys around him superstars (you know – Pippen, Rodman, Grant, and, of course, Bill Wennington). Yes, Jordan, despite his flaws, over any of those kids. OKC drops James Harden: I still think that this was a bad move. This is despite Kevin Martin becoming a great fit for the Thunder’s offense. This is despite OKC continuing to be one of the best in the west. This is despite my sentimental favorites, the Rockets, benefitting from Harden’s elevated play. Harden was on the cusp of greatness – a greatness that would’ve been enough to push Oklahoma City past even the mighty machine of Miami. Instead, they cut him loose. Yes, there were financial considerations to be made, but this was James Harden. Keep him with KD, Westbrook, Ibaka, and Perkins then get rid of the rest. Take in 7 guys from the D-League for all I care and this would still be a true title contender. If ever the Thunder fail to make a return trip to the Finals this season, then they can look back at this move as the first building block of their doom. Coach today, fired tomorrow: Let’s look at three coaches here. First we have Mike Brown. This is a guy who couldn’t steer a LeBron-powered Cleveland to a title. This is a guy who surprised everyone when he, and not Brian Shaw, was named the Lakers’ head coach last season. Of course, they crashed and burned. 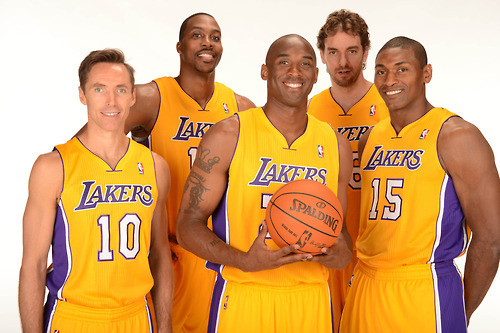 This season, he managed to land Dwight and Nash, and lost “only” Andrew Bynum. Still he couldn’t make things work. Bye bye Brown. He was replaced by the second coach we’ll look at – Mike D’Antoni. D’Antoni coached a different NBA team earlier in 2012. He and the Knicks were already reeling when Melo went down with an injury, and they would’ve been buried in the doldrums had Linsanity not happened. The Knicks were still far from title-worthy, of course, which is why D’Antoni got the boot. Now the reject from Manhattan is the guy tasked to bring order to Los Angeles. Oh, Irony, how unabashedly cruel you are. The last coach we’ll talk about is the guy who was the Coach of the Month this past November. Now he’s out of a job. He’s Avery Johnson. He’s the poster boy for how fast the winds of change move in the NBA. Some say it was Johnson’s fault anyway – that he failed to establish a good relationship with Deron and that he didn’t maximize the Nets’ available talent (shout out to MarShon Brooks!). I say Mikhail Prokhorov was just too damn impatient and impulsive. *This is the first of a series of “Top Stories of 2012” posts. I’ll do three more, one each for International ball, PBA ball, and local amateur ball. Lou Williams and Zaza Pachulia each recorded a double-double to lead the Atlanta Hawks past the Indiana Pacers, 109-100, at Philips Arena. Williams finished with 21 points and a career-high 12 assists, while Pachulia had 17 points and 14 rebounds for the Hawks, who have won 11 straight home games against the Pacers. Al Horford added 20 points and Kyle Korver connected on four 3-pointers en route to 16 points in the victory. David West poured in a game-high 29 points for Indiana, which had its season- high four-game win streak snapped. Eric Gordon provided the Hornets with the spark they needed, pouring in 24 points in 25 minutes in his return to the court as New Orleans rallied for a 98-95 victory over the reeling Charlotte Bobcats at Time Warner Cable Arena. Gordon, who had sat out this season's first 29 games while recovering from right knee surgery, added seven assists and helped the Hornets overcome a deficit that was as much as 21 points late in the first half. Twelve of his points came in the fourth quarter, during which New Orleans used a 22-7 run to take the lead for good. The Hornets outscored Charlotte by a 58-38 margin in the second half to deal the lowly Bobcats their 18th consecutive defeat. Michael Kidd-Gilchrist paced the Bobcats with 22 points, but only four came after halftime. Charlotte made just 14-of-39 field goal attempts over the final two quarters after shooting a scorching 62.5 percent in the first half. DeMar DeRozan poured in 21 points to lead the Toronto Raptors to a 123-88 dismantling of the Orlando Magic on Saturday. Ed Davis added 18 points and Jose Calderon had 15 points and 10 assists for the Raptors, who have won seven of their last eight. Kyle Lowry and Terrence Ross chipped in with 16 point apiece in the triumph. Andrew Nicholson had a career- high 22 points and seven rebounds and Arron Afflalo added 14 points and six assists for the Magic, who were without Jameer Nelson because of a sore hip. Brook Lopez poured in 35 points on 13-of-20 shooting and ripped down 11 rebounds as the Brooklyn Nets held on for a 103-100 win over the Cleveland Cavaliers on Saturday at Barclays Center. Deron Williams netted 15 points to go with seven assists, while Joe Johnson added 15 points for the Nets, who improved to 2-0 under interim head coach P.J. Carlesimo. Reggie Evans and Gerald Wallace each pulled down 10 rebounds to go with seven points in the victory. C.J. Miles dropped 33 points and made 8- of-10 from three-point range, while Tristan Thompson added a double-double with 17 points and 15 rebounds for the Cavs, who have lost two straight. Kyrie Irving netted 13 points and handed out seven assists, but missed a potential game-tying 3-pointer at the buzzer. Marco Belinelli paced Chicago with 17 points off the bench as the Bulls downed the Washington Wizards, 87-77, at the United Center. Carlos Boozer added a double-double with 15 points and 12 rebounds, while Luol Deng contributed 11 points and Kirk Hinrich poured in 10 for the Bulls, who snapped a two-game slide. Richard Hamilton returned from a 12-game absence because of a torn plantar fascia in his left foot and recorded nine points in the victory. Bradley Beal netted 14 points and Emeka Okafor finished with 11 points and 18 rebounds for Washington, which lost for the ninth time in 10 games. Russell Westbrook scored 28 points and Kevin Durant tallied 26 as the Oklahoma City Thunder delivered their highest scoring output of the season in a 124-94 thrashing of the Houston Rockets at Toyota Center. Westbrook added eight assists and eight rebounds, while Kevin Martin racked up 19 points off the bench to help the Thunder top their previous scoring high. That also came against the Rockets, a 120-98 rout in Oklahoma City on Nov. 28 that marked the first meeting between the teams since the preseason trade that sent star guard James Harden to Houston. Harden finished with 25 points against his former club, but shot just 6-of-17 from the field. Marcus Morris notched a career-high 24 points and Toney Douglas scored 17 for Houston, which was dealt a second straight loss following a season-best five- game win streak. Rudy Gay had 19 points in his return to the lineup, lifting the Memphis Grizzlies over the Denver Nuggets, 81-72, on Saturday. Gay, who also pulled down six rebounds, missed Wednesday's game against Philadelphia due to personal reasons. Zach Randolph added 12 points and seven rebounds for the Grizzlies, who improved to 13-3 at home this season. JaVale McGee, Corey Brewer and Andre Iguodala had 12 points apiece for the Nuggets, who had a two-game winning streak snapped. Kenneth Faried tallied 11 points. Nikola Pekovic led six Minnesota players in double figures with 28 points, as the Timberwolves edged the Phoenix Suns, 111-107, on Saturday. Kevin Love had 23 points and 18 rebounds and Andrei Kirilenko chipped in with 20 points, five rebounds and four assists for the Timberwolves, who put the brakes on a two-game skid. Luis Scola poured in a game-high 33 points and 10 rebounds, Shannon Brown had 21 points and Goran Dragic added 16 points and 12 assists for the Suns, who fell to 2-13 on the road this season. Brandon Jennings netted a team-high 25 points to go with seven assists and four steals, as the Milwaukee Bucks used a huge fourth quarter to top the Miami Heat, 104-85, on Saturday at the Bradley Center. Luc Mbah a Moute connected on 8-of-15 from the field for 19 points to go with seven rebounds, while Mike Dunleavy added 18 points, nine rebounds and six assists for the Bucks, who have won three of their last four. Dwyane Wade returned to action after serving a 1-game suspension for striking Bobcats guard Ramon Sessions and dropped 24 points with six rebounds, while LeBron James netted a game-high 26 points to go with seven assists and six rebounds, but it wasn't enough for the Heat, who have lost back-to-back games for just the second time this season. Nicolas Batum filled the stat sheet with 22 points, eight assists and seven rebounds as the Portland Trail Blazers held off the Philadelphia 76ers, 89-85, at the Rose Garden. Damian Lillard followed with 20 points, while J.J. Hickson contributed a double-double with 16 points and 13 rebounds for Portland, which won for the seventh time in nine games. Jrue Holiday scored a game-high 29 points to go along with nine assists, but also recorded seven of the Sixers' 13 turnovers. Thaddeus Young poured in 17 points, while Nick Young and Spencer Hawes each scored 10 in Philadelphia's eighth loss in its last nine road games. Stephen Curry poured in a game-high 22 points to go with nine assists on Saturday, as the Golden State Warriors handled the Boston Celtics, 101-83, at Oracle Arena. David Lee followed with 20 points and Harrison Barnes added 15 points and eight rebounds for the Warriors, who have won three straight. The Celtics were without starting point guard Rajon Rondo, who missed the contest because of a bruised right thigh and hip. Rondo's replacement, Courtney Lee, finished with a team-high 18 points, while Jason Terry and Paul Pierce chipped in 13 points apiece for Boston, which has lost two straight and six of its last eight.